In my role as a civil celebrant, I meet a lot of people who have been fed myths about marriage options . My goal is to bust at least a few of them! There are actually three ways you can marry. Firstly, through your church or synagogue etc. You will have a full religious ceremony, which will include the legal bits. There isn’t much opportunity for personalising the ceremony, though. Secondly, through your Register Office. This ceremony will not include any religious references, let alone the name of God. Like the religious ceremony, it will not be very personal to you (if at all). The Registrars will come out to a chosen venue, if you want – but this comes at quite a financial cost! The third option is to use a civil celebrant. This ceremony can be totally unique to you, but it will not be legal. Usually, couples get legally married by the Registrar and then move on to have the ceremony of their dreams in front of their chosen guests, which the celebrant writes and conducts. Although these options are of course available, as I have suggested above, these are not the only possibilities. You can marry where you like (subject to payment, permission or agreement!). At present, the registrars will come out and conduct their ceremony anywhere, so long as there are four solid walls. (They charge quite a bit for this, as I have indicated.) Legislation may change to allow them to perform marriages in the open air too, but this is as yet uncertain. At present, a civil celebrant can conduct a service anywhere, indoors or outdoors. 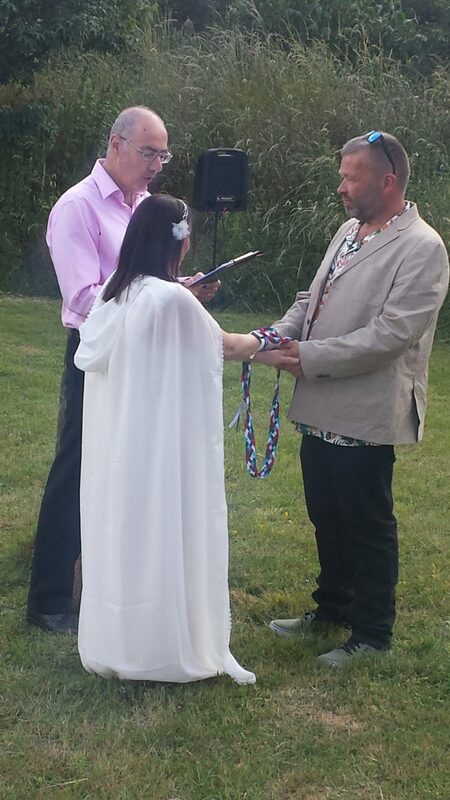 The venue can vary considerably: I have officiated at the Savoy, Stonehenge, on an exposed hilltop with fabulous views, at a canal-side sanctuary, in a (glorious) back garden – and the list goes on! You are limited only by your imagination. Obvious ways include reducing the guest list and choosing a modest venue. You can also save money by marrying out of season and even in the afternoon and midweek. Please glance through some of my suggestions. A lot of people want to be married by a celebrant. They know they can’t dispense with the legal ceremony, and then realise they have to pay the Registrars and the Celebrant too. There is a way round this. Go (by appointment) to the Register Office before the appointed wedding day (hours or even days before). Go with two witnesses, and you will be legally married. This will cost much less than paying the Registrars to come to your venue. The savings you make can go on hiring a celebrant for your tailor-made ceremony! So you actually have a lot more choice than you may have realised! I hope this has been useful in pointing out what may not be obvious. If you have any enquiries, then do contact me. If you know of any other myths that need clarification, let me know and I’ll be glad not to have to think up another subject for a blog! Michael Gordon can help prepare and conduct a tailor-made civil ceremony in or around London or, indeed, in Europe. Telephone me now on +44 (0)7931 538487 or contact me directly by e-mail.